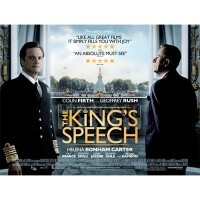 When I heard the original premise of a film centering around the difficulties of George VI and his stammer I was not bowled over. It did not seem a strong enough story to carry a whole film and was potentially another Sunday afternoon filler film. Then the hype started. Suggestions of Oscars and Bafta awards filled the newspapers and blogs. I decided to watch the trailer and was pleasantly surprised. Taking the plunge I watched it last night. I was not disappointed. I found this review very helpful because it made me want to go and see the movie for myself.